I've been waiting a year-and-a-half to start this thread since I picked out the back/side set at Mike's shop during the "Baranik Gathering" in 2011 (http://www.acousticguitarforum.com/f...hlight=baranik). I'm a Cocobolo lover anyway, and knowing that, Mike tempted me with a rare, flitched-matched set of Cocobolo with spider-webbing. Well, that was like showing a caffeine junky a Starbuck's triple latte. After wiping the foam off my mouth, I told Mike to base my Meridian off that set. He suggested a Colorado Blue Spruce top and I agreed. Mike says that the Colorado Blue Spruce that he has is some of the lightest and stiffest spruce he has built with and that it makes an extremely responsive guitar. Plus, I like the white coloring. We agreed on African Blackwood bindings since I like the dark bindings on my current JX. It's going to be a sharp/florintine cutaway, with Mike's standard Meridian scale (25.6") and string spacing, which I like. 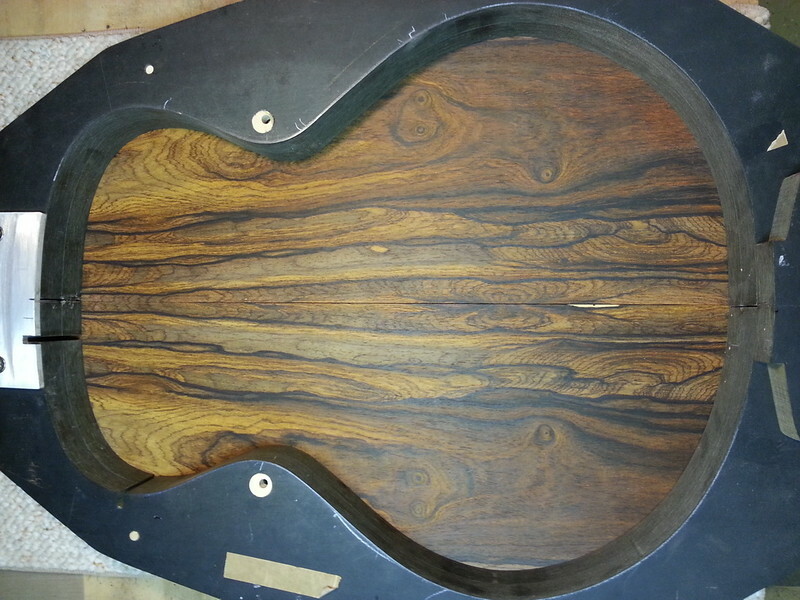 The inside double-side wood is going to be Spanish cedar, so the guitar is going to smell as good as it sounds. Mike is planning something cool for the accents on this one, but he hasn't showed me anything yet. Last edited by Cocobolo Kid; 10-01-2017 at 10:08 PM. Oh man, you are in for a serious treat. Wow, that's gorgeous! 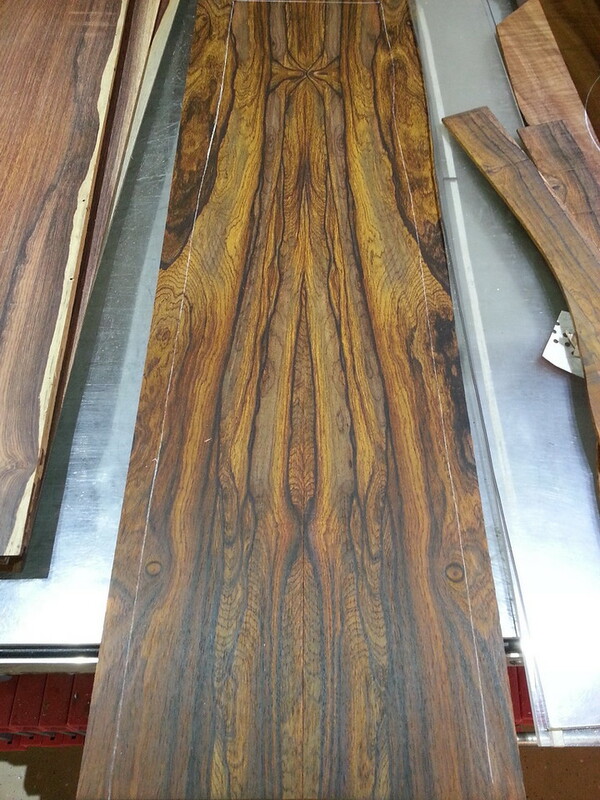 Didn't know Cocobolo can look like that! Oh man John, that is some seriously good looking blue spruce. I am a huge fan of the stuff. 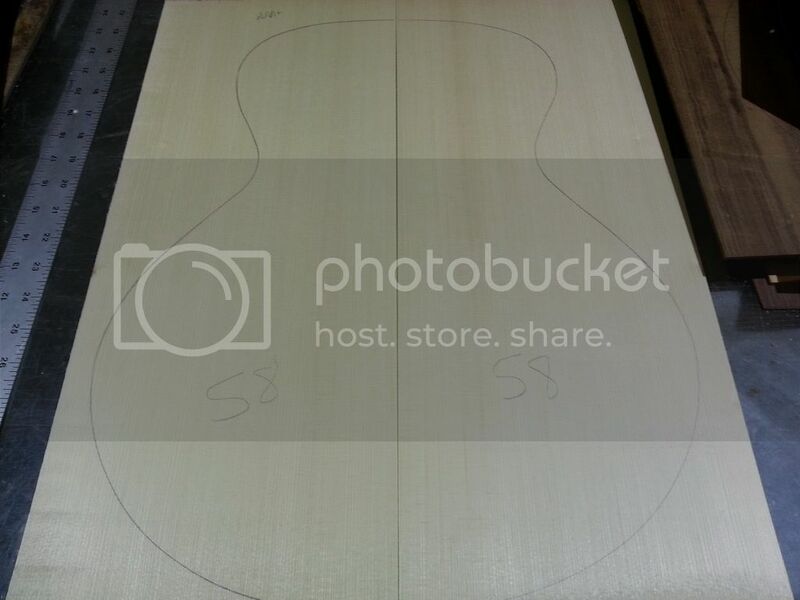 This is going to be one great guitar from a world class experienced builder with an impeccable reputation. Can't wait for the next pictures. You know John I have seen that set, but wow I don't remember it being that beautiful! I would have, however, advised a term less abusive to my ear though! Yeah, yeah, I know "sick" means "sweet" and all that... but I personally like "insane" or "outrageous" or incredibly complex" and the connotations those evoke! Most of this is pure envy though, so don't think long on it. I had no idea Mike was on the track of some blue spruce sets - although I know he had brilliant success with it previously. The set on my Meridian is much more "figured" - imperfections if you will - and nothing as straight grained as this. While that does not matter sonically, yours will be a cosmetically impressive guitar, with all the "wood elegance" that Mike builds in. Warm congratulations on reaching this point (the start) and I'll be watching with high interest!! Both the coco and the spruce look fantastic. It's going to be a wonderful guitar. Justin, Jason, Steve, Phil and Richard, thanks for the kind words and thanks for tuning in. I'll continue to post new photos as fast as Mike sends them to me. Mike estimated a May delivery time, so the pace of this thread should be pretty quick. Phil, As Bill Murray said in Scrooged, "Well, it's a little late to get this kind of feedback". . The thread titles aren't editable once the thread has been posted. Maybe the Cocobolo set didn't look this nice at the gathering because it hadn't been sanded at that point. I did get one more photo from Mike. Here are the two back sides getting glued together. 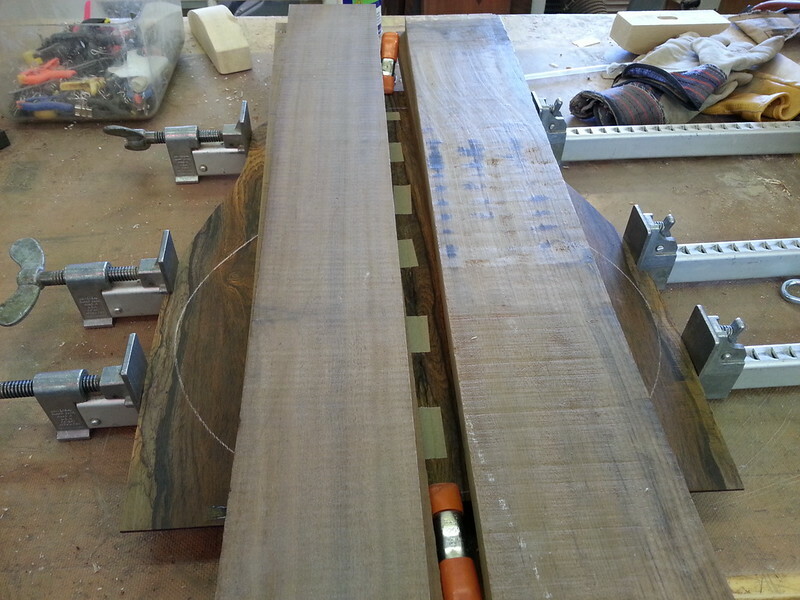 The expensive, quartersawn lumber used for weights will really add to the "weight" of the finished guitar's sound. I told Mike I didn't want a thin sound, so this was his solution. 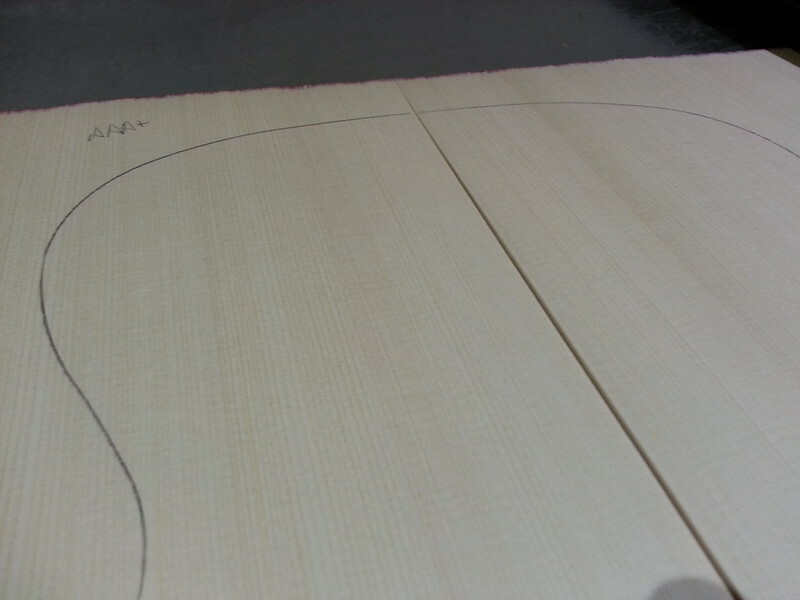 The segmented, center line of masking tape will also go well with the "racing" theme of this guitar. All jokes aside, I am very happy and excited that Mike is building this guitar for me. He is my favorite luthier and I am in awe of his talents when it comes to building guitars. Last edited by Cocobolo Kid; 10-01-2017 at 10:11 PM. Makes me want to drive down few hours just to see your guitar! Beautiful! Can't wait to see more! Congratulations on excellent wood choices and an excellent luthier! Love the top! Looks great, you can't go wrong with Mike. Is this what he refers to as black cocobolo? Hi Trevor. No, here's the black cocobolo. From a few feet away you can't see the grain. This shot was under some serious studio lights. It's quite heavy, like a lot of coco, but doesn't have the flame or figure of John's set. or color, or "sickness"...!! beautiful wood, amazing builder, can't wait to see this one come together! congrats! Nice cocobolo wood! Sweet top too!! Are you getting the adjustable neck version? Or the traditional fixed?